National HIV Awareness Campaign to Launch in D.C. 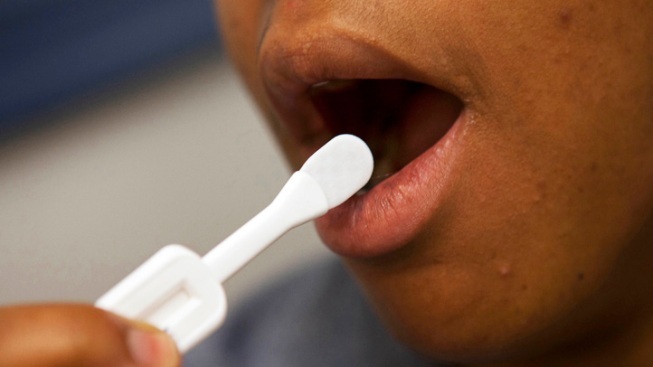 This file photo shows a patient using an oral test for HIV, inside the HIV Testing Room at the Penn Branch of the District of Columbia Department of Motor Vehicles. The Centers for Disease Control and Prevention is launching a new HIV awareness campaign at a public hospital in southeast Washington. The campaign urges people who have HIV to seek medical care, start taking medications and adhere to treatment. It's called "HIV Treatment Works'' and is meant to show how the disease can be managed and risk of transmission can be diminished. More than 1.1 million people in the United States are infected with HIV, the virus that causes AIDS. The HIV infection rate in the District of Columbia is 2.4 percent, which exceeds the World Health Organization standard for a generalized epidemic. Officials from the CDC and other federal officials will speak about the new campaign at a news conference Wednesday at United Medical Center.